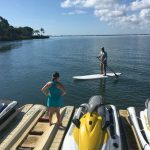 I tried Stand Up Paddleboarding. Before we moved to Florida, I had a whole list of things I was going to do. One of them was Stand Up Paddleboarding. I had seen people doing SUP on manatee tours, and I thought it was the coolest thing ever. I’m pretty lazy though, and I never really got around to it. We moved onto our boat about three months ago, and it was still pretty chilly. But the last few weeks have been glorious. It’s sometimes nice and calm in the morning, but then it gets choppy in the afternoon. This morning though was just perfect. It was warm, the water was still, and you could actually see the bottom today. Our little cove is normally cloudy with silt. We’ve made friends with the guys who have a little boat rental stand at the end of the marina. We were all in the hot tub the other night, and one of them was trying to convince me I can get in the water and clean my own boat bottom. I’m not totally convinced yet, but I’ll get there eventually. 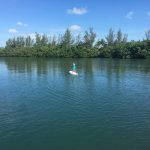 This morning, I looked out, and thought, perfect day to try paddleboarding. As I walked up the pier, they boat rental guy was fishing. I asked if he caught anything, and he said no. Then he asked me if I had tried Stand Up Paddleboarding yet. It was like I had put my thought out into the world, and someone answered it. So 10 minutes later, he’s showing me how to get on the board and paddle. I got right on, and I guess all those gymnastics lessons as a kid paid off, ’cause my balance was good, and I didn’t fall. 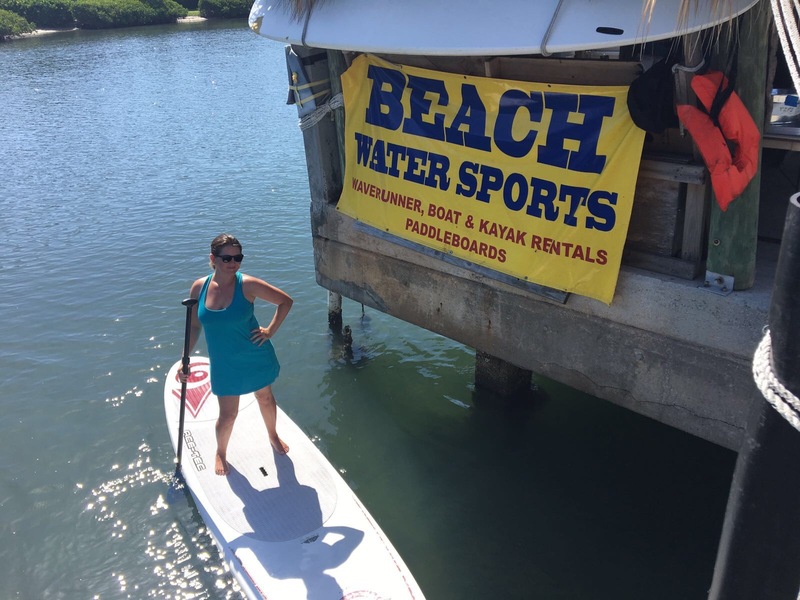 I paddled all over our marina, and even managed to crouch down on my knees and stand back up again a couple times to go under the docks. They even gave me a bottle of water which I sat on the board and it never fell off. Granted, it was super calm, and I only got the waves from one boat, but I was pretty impressed with myself! Stepping aboard. I just stepped right on there. No crawling on and standing up for me! Striking a pose. I was excited I had managed to paddle around a corner for a photo! So nice and calm, I paddled all the way out. 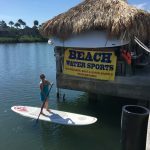 If you’re in Stuart or Jupiter, and want to try Paddleboarding, Kayaking or Jetskiing, go to Beach Water Sports. Super cool peeps. As some of you know, Matt and I have spent the last couple of years in an RV. (A caravan for the Aussie’s) We’ve had them for years. We had a Class C when Matt was travelling full time. We sold that, and then when I took a post on the Texas border with the guard, I got myself a cute airstream. When Matt joined me, we got a toy hauler, which we then traded in for a 5th wheel. We then moved to Florida, and spent a year in the RV. Then one day, I looked at Matt, and asked how he would feel about living on a boat. 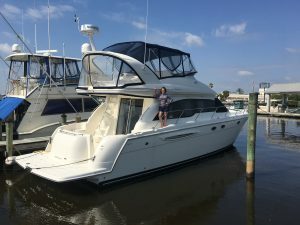 I figured I’d have to talk about boats for a couple years before he warmed to it, but all he said was “sounds expensive, show me it’s doable” so I showed him numbers, and it turned out a boat slip in Florida was pretty comparable to an RV slip. So we started looking. After a few months, we found our girl. So we went from this to this. The 5th wheel and my veggie garden. No garden, but lots of fish! We’ve been aboard about 3 months now, and it’s awesome! There’s this constant gentle rocking, that can put you to sleep in you’re not careful. There’s always a beautiful view. We get new neighbors all the time. There’s dolphins swimming around the marina every couple of days. It truly is the best move we’ve made. I made a little video tour so you can all see the inside. Hope you enjoy it. 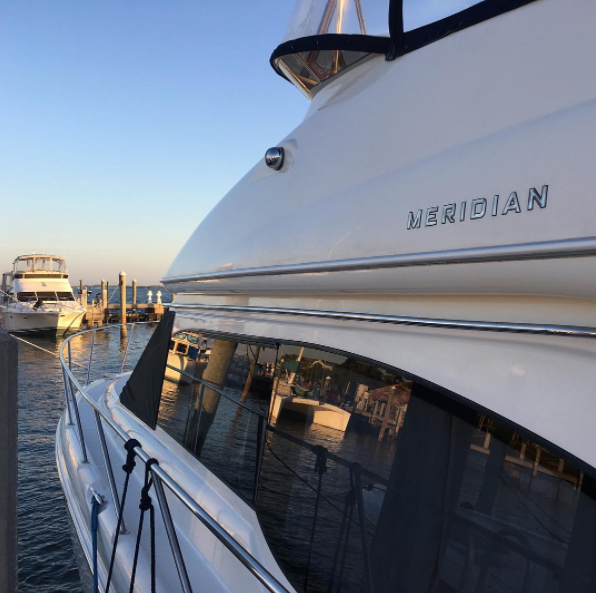 She’s a 2007 Meridian 411, with twin cummings diesel engines. She’s 41 ft long, (46 LOA) 14’2″ ft wide, and has a 3’9″ draft. Two staterooms, one full bath, one wet bath. We haven’t had the name put on the back yet, but it’s “No Kids”. That’s not only why we can afford her, but it’s also the rule…. So for those of you that have read Allegedly, you’d know that Matt and I rode off happily into the sunset in the last chapter. Well, technically we headed East, into the sunrise, and sadly, Maya didn’t make it with us. Matt and I have been wanting to move to Florida for so long now, and after I left my job, we just stayed in Victoria, Texas because we were comfortable. We had already sold the house in San Antonio, but we were still close to the ranch. 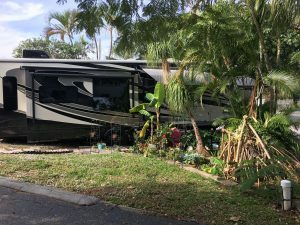 We liked the other people in our RV park, but it was a hassle for Matt, because it was over 2 hrs to the closest airport, and he travels almost weekly. Then, our friends started to leave the park, and Matt’s work started talking about dividing his territory. He could stay with Texas/Louisiana/Oklahoma, or get Florida/Tennessee/Georgia. It was just the push we needed. We had no reason to say in Victoria, and I dreaded the thought of moving back to San Antonio. So we spent forever looking for a new RV park we liked. We had sold our house already, and lived full time in an RV. People think this means you can just pack up and move anywhere. In theory it does. In reality, not so much. Matt really wanted to live somewhere between Miami and Ft Lauderdale. Each has a good airport, and both are big cities with lots of stuff to do. So that’s where we started looking. I’m amazed at some of the RV parks in Florida. Most were built back in the days before RVs had slideouts, so the slips are tiny. Then, in winter, they pack them in like sardines. Some RV parks double people up. The amount they charge in winter is astronomical. Some RV parks in South Florida charge as much for a tiny RV slip as an actual apartment. It’s literally just a tiny piece of land. Many of them aren’t even concreted. Miami and Ft Lauderdale fill up with French Canadians over winter. People reviewing parks said if you don’t speak French, forget it. They’ll actively exclude you. Then, the majority were either right next to a train track, or in super sketchy areas. 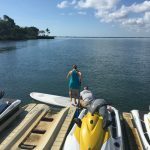 Matt and I drove to almost every single RV park from Islamorada in the keys to Boca Raton, and didn’t find anything we both liked. We almost gave up. Then, I found a place online that wasn’t listed in the RV guides. It was up further north in Palm Beach, which Matt had originally considered too far north, and he wasn’t sure of the airport there. But I knew it was meant to be. It was right off Australian ave. It was literally a sign. I had him look at the flights in and out of there, and he was satisfied it would work as his hub. I had just finished reading “The Official Preppy Handbook” and it assured me that Palm Beach was THE place to be. At least in Winter. Apparently I’m supposed to summer in the Hamptons, or Europe. So on his next trip to Florida, Matt checked out the RV park here, and it was ok. So we set a date, and we moved. We miss our friends, but, I’m so happy here. I’m glad we didn’t find what we wanted in the other cities first. I drive out to the island everyday to go workout. I found a beautiful place that does barre, yoga and pilates. They do spin too, but me and cardio aren’t friends. I try to go to a class everyday Monday to Friday. The people are super nice, and even though they all drive Land Cruisers and Porsches, they all think my lifted Jeep Wrangler is awesome. (It is) I’m not trying to get a supermodel body, I just want to get healthy, and it’s happening slowly. Barre is so much harder than I ever expected it to be. It’s harder than CrossFit was. I really enjoy it though, and Matt thinks I always look happier when I go. I’ve met some really cool people there. Even some that I have weird small world connections with. 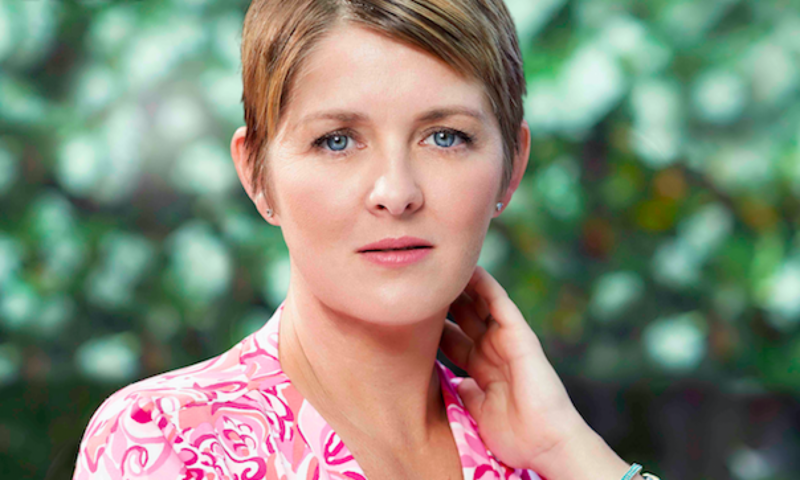 (Who would have imagined two people in a pilates class in Palm Beach would have both been interviewed by Tracy Grimshaw!) There’s also a bunch of expats here, and I’ve even made friends with another Aussie. One that I would have been friends with even if we both still lived in Australia. -Hey Maggie! The restaurants here are amazing. There’s every kind of food you could think of, and it’s all good. Downtown West Palm Beach has CityPlace and Clematis St, which are both super busy and filled with shopping and restaurants. We’ve found a few favourite places, but are still trying everything else. We even found a cute little hangout we both like called Camelot. It’s a bar, but they also do a member’s thing. Palm Beach is full of members only clubs. We can’t afford The Breakers or Mar-a-Lago, (seriously, they’re both over $100k just to apply, then there’s the yearly fee) but I totally joined Camelot, just cause I could. (It was $100 a year) They gave me a fancy metal membership card, and now I feel totally preppy, belonging to a club in Palm Beach. 😉 While Palm Beach is very seasonal, and almost empties out in Summer, (everyone really does go to The Hamptons) West Palm Beach is buzzing all year long. So even though we majorly downsized our life materialistically, I think we did a major upgrade spiritually. My quality of life here is so much better. I’ve never been happier. I’ve never enjoyed living somewhere so much. I absolutely love it here, and I’m grateful that Matt was able to move us here. The dream of living in Florida not only happened, but turned out so much better than I ever imagined it would. So, if there’s something you think would make you happier in life, do it. Just go for it. Maybe you adjust your expectations, or make compromises. You might find that you give up something that didn’t make you happy anyway, in return for something that gives you so much more pleasure. I have zero regrets about giving up our big house in San Antonio. I’m living large while living tiny. The trade off is totally worth it. I’m not suggesting you move to Palm Beach, but go find the place that makes you happy, and just make it happen. Be flexible with your expectations. The thing you might have thought of as a compromise might end up being the thing you end up loving the most. And just for the record, even if I was to become a millionaire, or even a billionaire, I’d still pick Palm Beach. It’s my happy place. I think the only difference is I’d pay off someone in the council to let me park the RV out on the island. Or build an RV park out there… Or live in someone’s pool house. Then again, I’m so close right here where we are, there’s not much point. Except to make Matt happy cause then he could walk to the beach instead of driving there. Most of these pics below are from my Instagram, but since some people don’t use it, I figured I’d share them here, so you could see how awesome this place is. If you are on instagram, go follow me (@Shrimptank) so you can see all the other amazing stuff I didn’t include here.